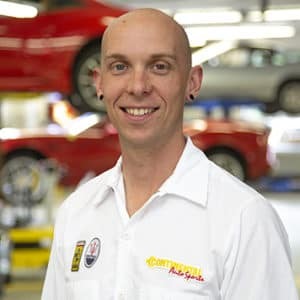 Since 1985, I have been the Service and Parts Director at Continental AutoSports. I also support the vintage race team as crew chief! Being an auto enthusiast for vintage vehicles of the 50s, 60s, and 70s, this is a natural fit! I enjoy overseeing projects involving and preparing vehicles for: award ceremonies, Classiche Certification, restoration and track events. I am extremely proud to be a part of this success and manage a team that consistently achieves awards for one of the top Ferrari dealers for service in the nation and Customers Satisfaction. For over 33 years of working with many of the same customers, I have developed lasting friendships. 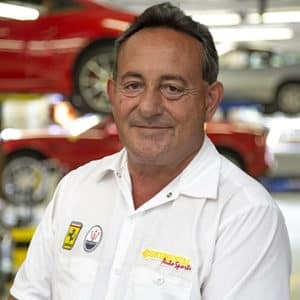 As Technical Services Manager since 1988, I have 30 years of experience at Continental AutoSports. 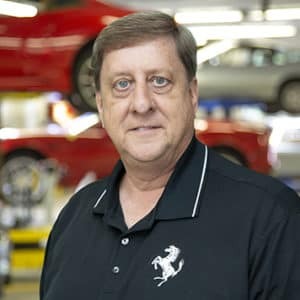 Serving as the dealer liaison to the Ferrari Club of America, I have helped numerous clients prepare their Ferrari’s and become recognized F.C.A. national winners. 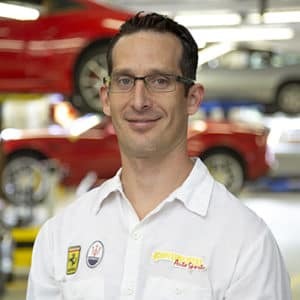 By working with Ferrari North America, I have assisted many clients in obtaining the Ferrari Classiche Certification which acknowledges and documents their vehicle as a part of Ferrari history. I joined the Continental family in 2004 and have had a true passion for the Ferrari brand since the age of 12. I have participated in multiple Ferrari National Meets (2005,2007,2009,2013,2015) and track events, where I have formed lasting relationships with our clients. 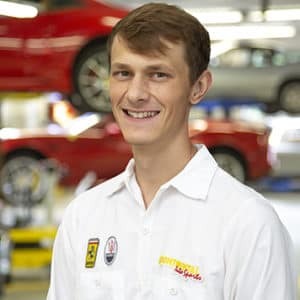 My passion and high energy for the Ferrari brand has helped me maintain those relationships, while also living up to Continental’s high level of customer service. 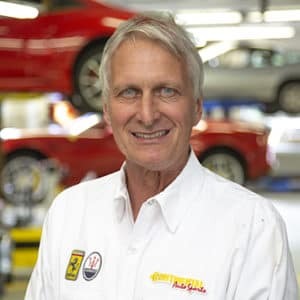 Since 1987, I have been with Continental AutoSports, completing over 43 Ferrari Factory Training courses, with a minimum of two to three additional classes per year. I have assisted clients: transporting, restoring, preparing for Concours and providing track support for all types of Ferraris gaining recognition and coveted awards. In 2007, I was one of the first group of fourteen Ferrari Technicians in the world to be certified “Ferrari Master Technician”.I also achieved and became a Ferrari Certified HVT, High Voltage Technician, (La Ferrari), Ferrari Certified Classiche Technician, Bosch Certified Electronics Technician, ASE Certified Master tech, ASE Certified Advanced Engine Performance Specialist, ASE Certified undercar exhaust specialist. I also own a TIG welder and perform all the in-shop TIG welding. Since its conception in 2006, I perform all of the Classiche Certifications at Continental for Ferrari SpA. For over twenty-five years, I have been a member and supporter of the Ferrari Club of America. 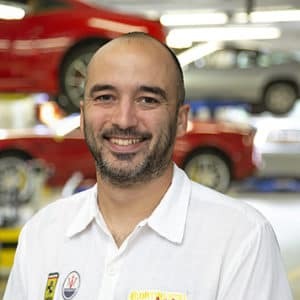 I am a factory trained Ferrari Master Technician with over 10 years’ experience working on Italian automobiles. After high school, I attended Universal Technical Institute in Glendale Heights, IL where I graduated with a 4.0 GPA in 2008 and shortly after became ASE Master Certified. In 2008 I was recruited by Ferrari North America to join the Ferrari Elite Apprentice program. I spent three months working at Ferrari North America and an additional three months at the factory in Maranello, Italy. 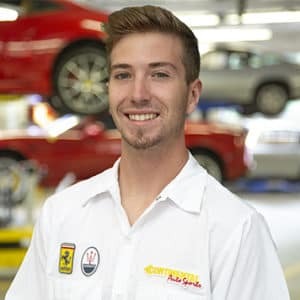 I graduated from the Ferrari Elite Apprentice program in 2009 and have worked at Continental AutoSports ever since. 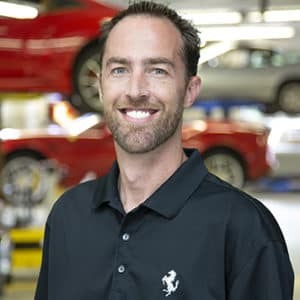 While I only recently joined the Continental AutoSports service team in 2015, I have extensive experience working on Ferraris, even of the highest caliber. After attending many of the Ferrari Technician training classes, I achieved the title of Ferrari Master Technician. My passion for cars goes beyond simply driving as I very much enjoy working on some of the most exotic and rare cars out there. My passion for cars started in high school when I realized I wanted to become a mechanic. In 1998, I began my career at Continental AutoSports. 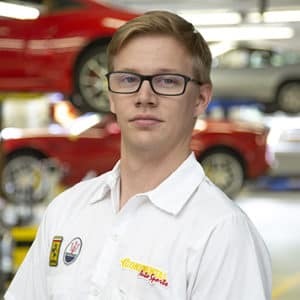 After attending multiple Ferrari training courses at FNA, I became a Ferrari Technician. 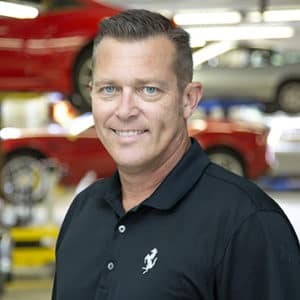 With over 22 years of automotive experience, I have had the privilege of working on some amazing and unique vehicles. I truly can’t think of a better place to work! 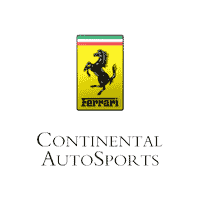 In 2014, I joined the Continental AutoSports team. Luxury cars like these require careful attention all over, down to the Italian wiring. This careful attention is what I enjoy about working on these cars, requiring only the best in dedication to understanding the craft. New to Continental AutoSports in 2018, I am a versatile technician with a general passion for cars. Working on cars like these is somewhat of a dream for any technician, so I am bringing all my passion, focus, and energy into working on each car. I have grown up embracing the Ferrari brand and attending Ferrari Club of America events ever since I can remember. I have been told that motor oil runs through my veins. While at work, I receive my daily dose of pure Ferrari excitement! I have been working in the detail booth at Continental for over 30 years. I am careful, meticulous, and have experience with some of the rarest and exotic cars out there. When I am finished, the cars look as good as new. I have been working in the detail booth at Continental AutoSports since 2017. In that time, I have learned plenty about what it takes to keep these impressive cars looking as good as they should. I have been certified in ceramic paint coating which is one of the most advanced ways to protect the paint and look of your vehicle. Joining the Continental family in 2014, I have been taking care of Ferraris for a couple years now. My experience here has grown my interest in cars and focused my attention on what makes these cars special. In our detail booth, we ensure to take the best possible care of customers’ cars, as we realize what these cars mean to their owner.